One of the main achievements in the world of data routing over the last two decades is the emergence of the distributed routing architecture. Using various routing protocols (RIP, OSPF, EGRP, BGP, etc. ), networks are created and modified dynamically and automatically. VoIP routing is much more complicated than data routing, but with no routing protocols. Traditionally, enterprise VoIP networks are controlled by the IP-PBX and call routing is typically based on static routing tables. The situation becomes complicated for off-net calls. The IP-PBX deals with such calls by directing them to the nearest media gateway or session border controller (SBC). In the case of multi-branch organizations, a single VoIP network may have several IP-PBXs from different vendors, as well as media gateways and SBCs. Each IP-PBX, SBC and gateway in the network has its own static routing table resulting in a distributed system in which the included elements do not communicate with each other. In theory, one could configure all the network elements once and leave everything unchanged. In reality, however, organizations’ VoIP networks are constantly evolving due to a variety of factors: mergers & acquisitions, new locations, integration of new & old IP-PBXs (or even legacy PBXs) and integration of SBCs and gateways. In addition, there is the organic growth of an organization and the accompanying technology evolution, such as introducing unified communications to the network and consolidating IP-PBXs. All of this makes managing the organization’s VoIP network a nightmare. A static approach is no longer fit for the job - there is a need for a centralized routing management system. System administrators should be able to design and modify their voice network topologies and call routing policies from a single location, resulting in significant time and cost savings. Time-consuming tasks such adding a new PSTN or SIP trunk interconnection, adding a new branch office or modifying individual users’ calling privileges should be carried out simply and rapidly. AudioCodes Routing Manager (ARM) is a holistic, scalable, dynamic routing manager based on software-defined networking (SDN) principles. The AudioCodes Routing Manager decouples the device layer from the network routing and policy layer, automatically creates complex VoIP networks, and simplifies routing rules, monitoring and management configuration. The ARM learns about the SBCs and gateways in the network automatically and dynamically. Every change in connectivity and configuration is reported to the ARM. Gradually, the ARM builds up a complete picture of the network topology, connectivity and health. The ARM also assists with the design and creation of the VoIP network. 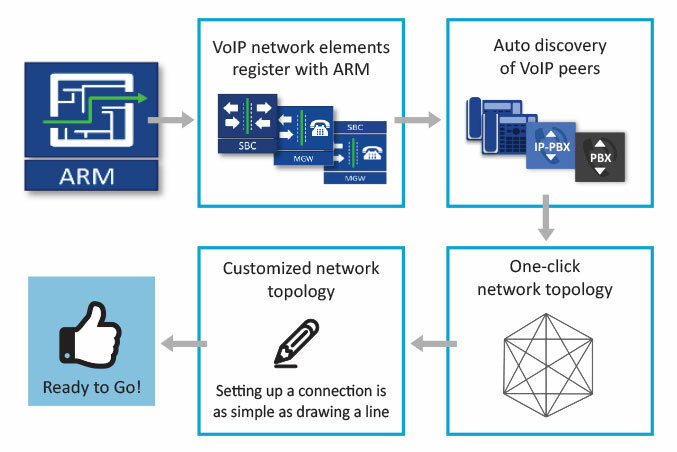 With the ARM, a network can be created with one-click. The administrator can choose between mesh, star or dual star formations and all the connections are automatically configured in the SBCs and gateways. This can significantly reduce the time needed for professional services as there is no need to configure hundreds of classification rules, trunk groups, profiles and routing rules. And all of this is provided through an intuitive and simple graphical user interface. The AudioCodes Routing Manager also looks at user attributes to optimize routing calculations. It imports and aggregates user information and huge dialing plans from different sources (e.g. LDAP server and CSV files) and groups users and dial-groups for routing calculation and implementation of number portability. The AudioCodes Routing Manager is a critical solution. It reduces the operational time spent on designing and provisioning the network topology; it dramatically reduces OPEX by avoiding routing configurations of many VoIP network elements; it lowers the need to rely on telephony experts; and it reduces the time spent on adopting evolutions in the network.